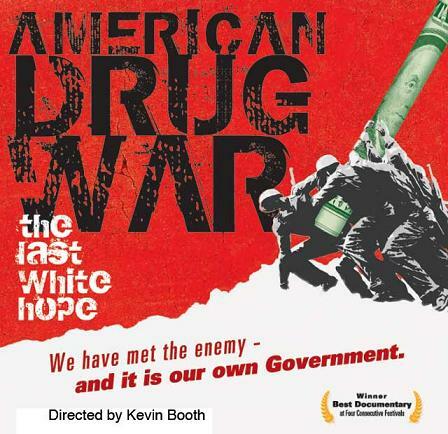 American Drug War : The Last White Hope details the journey of Producer/Director Kevin Booth trying to understand the complexity and paradoxes of the ongoing drug war in America after losing three members of his family to legal drugs such as alcohol, tobacco and prescription drugs. Through a wide variety of interviews with users, dealers, DEA officers, CIA operatives, the former US Drug Czar, prisoners, wardens, doctors, medical marijuana administrators, lawyers, victims and rednecks the documentary covers a huge range of the the opinions and issues revolving around this highly controversial issue. The documentary explains the process behind the ongoing escalation of the drug war to the point at which is it now an $18,000,000,000 + industry which is mostly used to pay for the imprisonment of drug violators, revealing the astonishing fact the 50% of American prisons are now filled with non-violent drug offenders. Comparing the ideas of prohibition to regulation the documentary explores the highly succesful 'Medical Marijuana' system instituted in a dozen states across the country, as well as traveling to Amsterdam in Holland in order to compare the 'drug proble' in a country that has decriminilised drug use, only to find that it now has only 50% of the drug use pr capita than America. Delving further into the powerplays of the drug war, the film includes direct interviews with LAPD police officers, DEA Agents involved in illegal trafficking and Ricky Ross, former crack cocaine kingpin of South Central Los Angeles who had direct connections to Nicuraguan supplies of Cocaine which was used to fund the Contras as brought to light in the Iran Contra Scandal. Further evidence in the documentary proves the connection between the CIA and elements of the Reagan White House during the 1980's 'War On Drugs' period when Crack was first introduced into American ghettos. Looking into the interests of the drug war, from corporate powers in tobacco and alcohol to the privatised prison system itself, the documentary suggests that the prohibition of drugs has more to do with racial and religious discrimination than it does with health and rehabilitation. This is especiallyevident in the case of psychoactive substances such as magic mushrooms and other naturally occuring psychoactives which have been used in the ritual practices of traditional cultures around the world, including the Native American cultures of north and South America. American Drug War is one of the most comprehensive documentaries on this subject to date, exploring the issues and problems perpetuated by a war, which by it's very definition can never be won. and they say it's medicine; of course that this plant has medicinal properties and not only in smoking but I'm sure that 80% of the population that consuming marijuana 10% they use it for reasons of herbal and the rest is used for debauchery, fornication, witchcraft and serve other gods; Anyway most of the marijuana smoked in America come from the drug cartels of Mexico. And back to the same the snake biting its own tail.